Mexican wolf F886, Corazon (which means "heart" in Spanish), was born in April of 2004 at the Endangered Wolf Center in Eureka, Missouri. She is the older sister to M942, Brio, who also lives at Southwest Wildlife. She would have helped her parents, M520 Picaron and F547 Tanamara, raise Brio and his siblings born in the 2005 litter. The story of her parents, Picaron and Tanamara, is a wonderful one, and can be found on Brio's page here on the website. Corazon spent some time at Ted Turner's Ladder Ranch, and at the USFWS Mexican wolf facility at Sevilleta National Wildlife Refuge, in Socorro County, New Mexico. 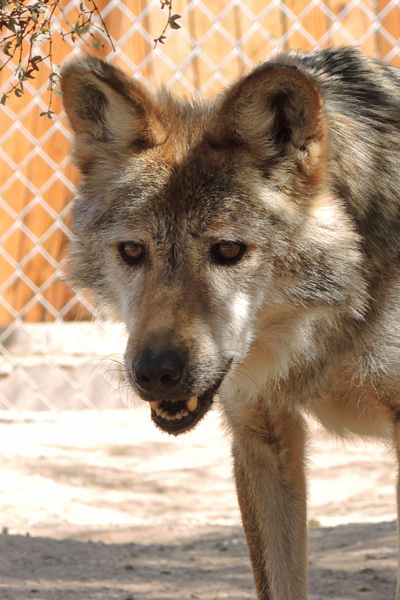 She met her current mate, the younger male M1019, Wild Bill, at the Endangered Wolf Center during her time there. They moved together to the Oklahoma City Zoo in 2015 before retiring to Southwest Wildlife in the fall of 2017. She and Wild Bill are still adjusting to their new home and we look forward to getting to know them better. Welcome Corazon!